Bill Clinton probably wasn't trying to undermine Barack Obama this week. But that's pretty much the effect that one particular interview he sat for during his annual Clinton Global Initiative mediathon had. By now it's old news that Clinton has struck up a friendly relationship with some of his old right-wing tormentors. Perhaps his most notable rapprochement has been with Christopher Ruddy, who gave life to Vince Foster and Ron Brown conspiracy theories in the 1990s and went on to found the far-right site Newsmax, which once proudly announced that James Carville had labeled Ruddy the Clinton White House's top antagonist. Ruddy, the story goes, changed his tune a few years ago, concluding that Clinton's actual record as president -- free trade, welfare reform, budget surpluses -- didn't warrant the hysteria that the right had whipped up while he was in office. And Clinton, happy to win over a key component of the right-wing noise machine, was ready and willing to bury the hatchet. As a result, Clinton will now occasionally give exclusive interviews to Ruddy's publication, which affords him a level of deference and respect that would have been unthinkable a little over a decade ago. But that doesn't mean that Ruddy and Newsmax aren't pushing a clear agenda, one that's every bit as anti-Obama now as it was anti-Clinton back in the '90s. The idea that now is the exact wrong time to raise taxes, of course, is the basic line that the right is now using to counter President Obama's new call for higher tax rates on the wealthy. Conservatives have taken delight this week in claiming that Obama is guilty of flip-flopping because he himself argued two years ago that "the last thing you want to do is raise taxes in the middle of a recession." (As Ezra Klein explained, there's really no contradiction here -- the economy is no longer in a literal recession, plus the taxes that Obama is now calling for wouldn't go into effect for two years.) 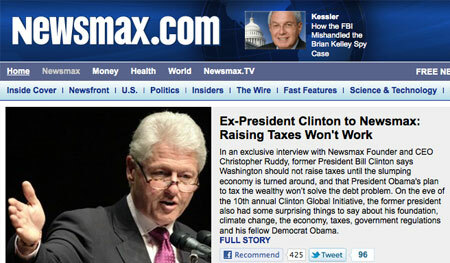 And now, thanks to the Newsmax interview, they'll probably start claiming that "even former President Clinton agrees with us!" The reality of what Clinton was saying seems to be more complicated. In the interview, his comments about not raising taxes are in reference to the jobs plan that Obama is now pushing -- which is separate from his call for higher taxes on the rich. That jobs plan, Clinton noted in the interview, doesn't include any tax hikes but does include "$250 billion in tax cuts, $250 billion in spending over a period of two to three years." It's at that point that he made the comment that became the basis for Newsmax's headline: "I personally don’t believe we ought to be raising taxes or cutting spending until we get this economy off the ground." It seems clear that Clinton was talking about the jobs plan, and the issue of what America should be doing right now to stimulate the economy. This isn't in conflict with what Obama is calling for, which is a tax hike-free jobs plan to get the economy moving now and higher taxes on the rich two years from now, in order to reduce long-term deficits. Newsmax probably knows this, but the headline it has chosen fits perfectly with the message the right is now pushing, and there's no attempt in the article to explain the difference between Obama's jobs plan and his tax plan. Not surprisingly, conservative opinion-shapers are already tweeting out the news that Bill Clinton said something that sounds an awful lot like what Republicans are now saying, and the Republican Party has apparently distributed his quote to the press. Not that Clinton is blameless here. In the interview, he seemed to be trying to play the statesman/above-the-day-to-day-fray role -- maybe because that's the role he tries to play through CGI, or maybe because he was just happy to have a right-wing media outlet treating him with such respect. Either way, he passed up a chance to remind Newsmax’s conservative audience of an aspect of his presidential record they tend to forget: He raised taxes on the rich when the economy was just starting to recover from a recession in 1993 -- but it didn’t hurt the economy and did end up being one the major reasons for the budget surpluses of his second term. Instead, he told Ruddy that he’d personally be fine with paying a millionaire's surcharge, "but it won’t solve the problem." Thus, the first line of the article notes that Clinton said "that President Obama’s plan to increase taxes on the wealthy won’t solve the debt problem." What Clinton said is true -- by itself, a millionaire's surcharge won’t solve the debt problem. But Obama is actually calling for $1.5 trillion in new revenue, to come from the expiration of the Bush tax cuts for the wealthy (returning them to their Clinton-era levels) and from limiting deductions and closing loopholes. By itself, this wouldn't wipe out the deficit either, but Clinton could have cited his own tax hike (a tax hike that every single Republican in Congress voted against) as proof that it would help. But he wasn’t looking for a fight. And neither was Ruddy -- at least not with Clinton.